Put the first 8 ingredients in a small pot and heat slowly over medium heat. While stirring constantly, heat until the sauce thickens a little bit (1 to 2 mins). Garnish with sliced scallions and keep on the side. Can be made ahead of time. Whisk together the water and the eggs in a bowl. Stir in the sliced cabbage, peppers, sesame seeds, and then stir in the baking powder and the flour. In a 8 inch nonstick oven proof pan, add 4 slices of bacon and cook until the fat begins to render from the bacon, 3 to 4 minutes. Top with one-quarter of the batter and cook undisturbed until the sides are set and are crispy, 3-4 minutes, carefully lift the pancake to make sure the bacon is crisp and the pancake is crispy. Flip the pancake so the bacon is on top and the bottom of the pancake can cook. drizzle a tablespoon of the oil around the outside of the pancake to help the bottom become crispy. 3-4 minutes. Now place the pancake in the oven to finish cooking about 3-4 more minutes if needed. Turn out onto a plate. 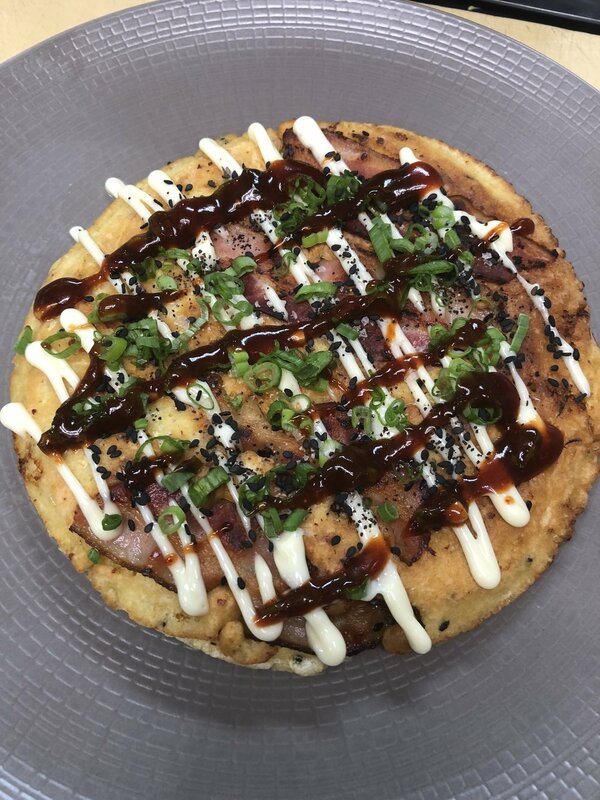 Top with Kewpie mayo, scallions, and the okonomiyaki sauce. Eat warm!